Throughout day Arab students mark what they call 'Nakba Day'; Jewish students demonstrate opposite. Arab students at Haifa University today (Monday) marked what they call 'Catastrophe Day' - Nakba. 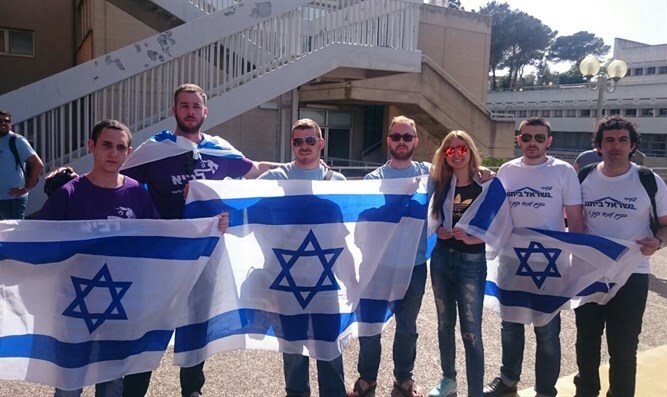 Jewish students demonstrated opposite them waving Israeli flags. "We appealed to the university a week ago to cancel the event," said Daniel Siegelov, head of the Likud cell at Haifa University, who told Arutz Sheva about the need to prohibit the event and the humiliating compromise that was reached. "It is inconceivable that an institution financed by the state would fund activities that mark the day of the establishment of the state as a day of mourning. The university did not accept our demand." According to him, the decision to allow demonstrators to hold their ceremony a week after Independence Day is a disgrace to the government. "Although the university's legal adviser demanded that they delete the expression 'ethnic cleansing' from the leaflets they distributed, they were allowed to hold an 'exhibition of pictures of villages and cities that were ethnically cleansed in 1948'. They deleted the expression 'ethnic cleansing' from the leaflets but continues to be up on Facebook. I think it's a shameful day. I'm ashamed that at my university they mark Independence Day as a day of mourning and disaster for the State of Israel."